It it OK to use this silicone grease on the front brake caliper slider pins to lube them up? I already have this handy. Or is there a recommended grease to use? It looks fine with rubber but there is no mention of temperature. Like this. Don't use copper grease. I have started using red rubber grease on the caliper sliders on my cars after years of using copper grease. It doesn't effect the rubber covers, has not deterioated like copper grease over time and has remained stable with high temeratures. I think but I'm not sure -40degC to +200degC found in this link. 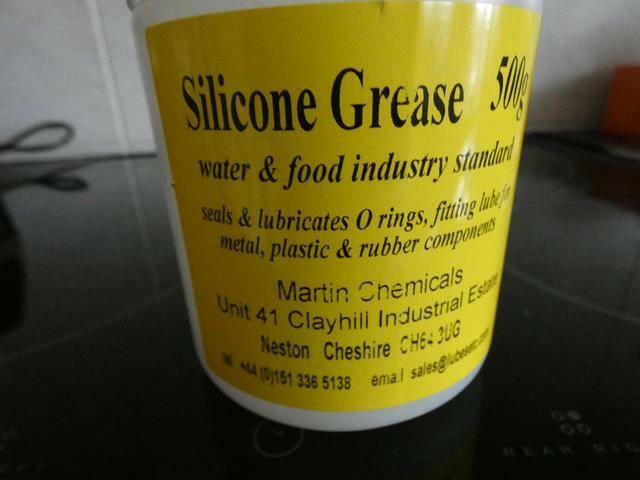 https://www.lubesetc.com/silicone-grease-lubricants-22-c.asp. Will send them an email. It'll probably be fine. The Omega is hardly a point and squirt car. I'll give it ago and if I get any problems will report back. Glad to help, if indeed I did! Any help or advice is always grateful. IME, anything slippy will do. Copperslip. Grease. Margarine. Please don't use just anything slippy. Copperslip soaks into the rubbers over time and causes the rubbers to swell. This can lead to ineffective brakes. I'm not sure on the other suggested lubes, but personally I'd use the proper stuff. Granted, the sliders are less of an issue than the piston seal and dust capm but still. 200° isn't enough. Use this at your peril. The reason I said 'probably' OK, is because whilst brakes get hot, the caliper brackets shouldn't be as hot as the friction surfaces. As most people measure the heat on the friction surfaces, I would have though 200 degrees is enough. But I'd use red brake grease in the first place. Which is a little worrying. The boiling point of DOT4 brake fluid is only 230 C, so if the caliper support has got up to 200 C I think the grease would be the last of your worries, TBH. What happens to the front brakes on a heavy car used on an nsl dual carriageway with lots of roundabouts will get alot hotter for longer. If parked immediately after, then heat soak could become a concern. *This test, whilst interesting, is on a light weight car which is stationary.